"We've had access to a Windows Phone running an official Windows Mobile 6.5 build for a few days and found it to be an impressive, stable, responsive operating system. 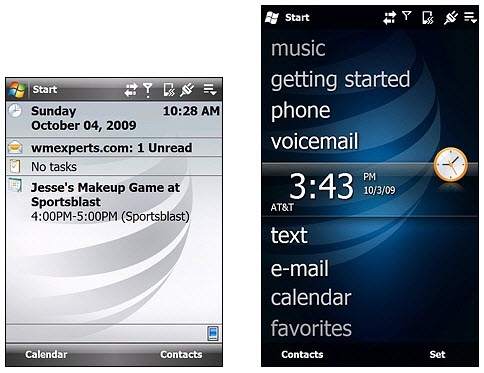 Windows Mobile 6.5 is graphically enhanced with the new Today Screen, colorful icons (or widgets as the youngsters call them) and an overall improvement over Windows Mobile 6.1." WMExperts has published their review of Windows Mobile 6.5, and they've done a good job of comparing the old and the new, side by side. The new 6.5 interface is certainly prettier, but looking at the above screenshot, you can't help but notice that there's less information presented. Sure, the lock screen will show you your next appointment, but one of the things I've always liked about the Today screen is the amount of information available at a glance. I suppose this evolution is inevitable, as anyone who's used HTC TouchFlo 3D has gotten used to having less information presented on the home screen. I was reading through some of the comments posted to the WMExperts article, and it got me wondering how many bugs and limitations have been addressed in Windows Mobile 6.5. Has the multi-computer sync story gotten any better? Has there been any improvements to Windows Mobile Device Center? I suspect the answer is "No" in most cases - I think Microsoft is so focused on cloud sync (read: Exchange Server) that they've forgotten that some people still want to connect the phone to their computer.